But for the future, I'll try to be good. There are no excuses for me not bloging. Especially when I have committed to several activities on the Internet that needs blogging. My life has been on standby, but unfortunately, time did not. And yes! I do feel guilty and do have a bad conscience. I have received the most beautiful handembroidered postcard from my seacret angel. It is adorable. Thank you so much. And I received my Friendship bag witch included delicious cookies. I loved everything about it. I have done some stitching, unfortunally I cant show you all. But someting I can. I’ll post pictures later tonight when the batteries to my camera are recharged. What I can show you now, is my Kaffe Fasett Quilt that I completed this month. Liz at Kaktus Quilt did a great job and quilted it on her longarmmachine so it was done and presented at the gathering where the designer him self gave a speech. results in 3 gifts + one extra for those who told about my Giveaway at their own blog. This has been so exciting. I know from my own experience that you find nice blog’s around the Internet by surfing from one blog to another. It gives you a lot of inspiration and ideas. And by doing this I hope I’ve made my self a lot of new friends and that you all will come back to visit, and that my blog can bring you candy for your eyes and inspiration for your hands and heart. You are certainly my source of the kind. Thanks to all of you who bothered to comment, and to all of you that didn’t. You are all welcome back. Congratulations. Thank you for participating! This has been so much fun, and it isn’t over yet. Now I am of to purchase surprises’ in Pink, Offwhite and in a varaiety of autumcolours. I need to do this more often, and soon it will be Christmas. Just 112 days to go. And then I came across a beautiful giveaway. Finally my calendar says September. Weather has been like autumn for weeks now. It’s been an odd summer this year. Now it is really September and we can all enjoy sewing, not feeling guilty for doing so. During summer it is not appropriate to hide out in the sewing room. Today is the set date for my Giveaway. I’ll give it today as well, for signing up. And then, tomorrow, I’ll do the counting on how many…..
Siw Hege is having a lovely giveaway. Pop over and join in. 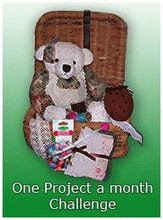 But I managed 1 completed project this month as well. Perhaps some of you girls recognise some of the blocs. It is the result of a block-swap at Stoffbytteklubben. It turned out pretty nice in my opinion. I have also received my 2.5” pieces from another swap. Aren’t they just lovely? I can’t wait for the day to come, when I can play with them in combination with my sewing machine. Wonder what they’ll transform into? Close to closing day for the sign up, regarding my giveaway. I’m so happy I got new friends by doing this. I was pretty surprised on all the foreign bloggers who found the way to my blog. I love you all. One week has gone after I posted my anniversary and the appurtenant giveaway. I got 19 comments so far. I am so thrilled. A couple of more entries and the numbers of winning prizes will increase. If this continue during the next weeks there will be some nice goodies going to some happy winners next month. I am amused by the variety of choices among the ladies who has entered. That is so inspiring. Keep coming forward. I love preparing presents. In the meantime while I wait for the drawing to approach, I am onto some stitching. 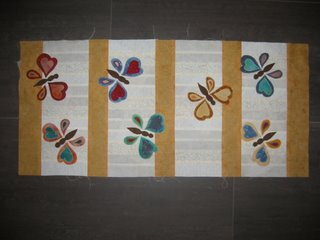 My Kaffe Fasett top is completed and is handed in to be quilted at Kaktus Quilts. Can’t wait to get I back. and a stitchery motif is almost completed (future surprise, cant show you...). 29. August will be my 3 year of blogging? Who would imagine that I would continue to do this for so long? And still want to proceed. I love to tell about my quilting life, getting inspiration from others and making new friends. And yes, I’ve made bonds with a lot of you. Don’t let me down this time! Old and new friends, please enter! To celebrate this event I’ll perform a giveaway. I can’t tell you all what the price is, because that’s what you are going to do. Leave a comment telling me what color range or witch production you would prefer. 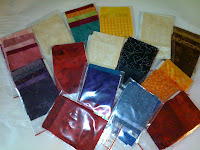 For each 20 different quilting bloggers who enters I’ll draw one price. Meaning prize list could be huge. Not quite :o) Signing up limit is set to September 1. Then the prizes will be purchased. I was tempted by Synnøve to join the Friendship Bag Swap over at the Quilting Gallery. If you check out her blog and her first try to make the bag, it is gorgeous and I figured if I joined this I would be in the position of owning more than one homemade handbag. Made by me, and others. A challenge I could not resist. Just cant wait to fill this bag with goodies. That's the best bart of it. It is a kind of a secret everything I do at the time. Meaning it is autumn ahead. It always starts with new clean paper sheets and new crayons in the fall. I’m in, I love these swaps!